Fairytale Wedding Favors - Everyone loves a fairytale and to live happily ever after. Create an enchanted atmosphere for your special occasion with just the right touch. We carry unique fairytale favors that are great for weddings, bridal showers, sweet 16 and quinceaneras celebrations! We have fairytale candles, placecard holders, favor boxes and other unique items! 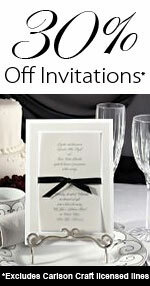 We also carry elegant fairytale wedding invitations! Make your next gathering of family and friends a most charming time where dreams can come true.